A few weeks ago at my church we had a sermon on fasting. It was a good sermon, largely compiled from Richard Foster’s Celebration of Discipline, but a good sermon. It, as I have not yet told the one preaching it (who blogs here), inspired me to try to take up the ancient Christian practice of fasting, at least partially, on Wednesdays and Fridays. This has had mixed success thus far. But I’m not writing to you about my fasting habits, Scripture rather prohibits that, at least in this kind of a public manner. Rather, I want to write to you about the nature of feasting and fasting in Christianity. In a conversation with a friend the other day, I used feasting and fasting as examples of ways we can try to live out the Church Calendar in our daily lives. The whole of the calendar is centered on this kind of back and forth with regular meals and smaller feasts throughout. In Advent we’re meant to fast; in Christmas, we feast. In Lent, we fast; in Easter, we feast. In Ordinary Time we keep eating, but we don’t feast as much; and sometimes we fast, but not as intensely. There’s this rhythm to it all so that neither spend too much time fasting nor too much feasting. Of course, there’s plenty of room in the Calendar for special feasts and fasts. But this brings me to two points concerning feasting and fasting I think very important: The high and low nature of feasting and fasting and the necessary link between feasting and fasting. In feasting and fasting we get this very paradoxical mix of the high and the low. Culturally speaking fasting is perhaps on the high end. Only those with enough food, who know when their next meal is coming, can fast in the way we so often mean it. It is because I know that there will be eggs in the fridge Thursday morning that I can fast Wednesday night and use it as a cutting out of something I have regular access to. For those who go to bed hungry, fasting is often not an intentional spiritual discipline but a way of life for they know not when they will eat again. The kind of fasting we so often do is therefore a privilege (and the reason Isaiah suggests fasting should be accompanied by feeding the hungry). Feasting, on the other hand, can be culturally low, in the sense that nothing is more common, more accessible to all people than a celebration involving food. Yes, even the impoverished can feast on that happy day when they have enough to eat for the night (however, if feasting means eating only special or expensive foods, which it should not, then it too is culturally high, but it is no longer feasting). Yet spiritually feasting is something of a high for us as it is a celebration of good that has happened in this world (the birth of Christ, his resurrection, etc.). Fasting, however, brings us low, reminds us of our sinfulness (often the sins we cover up with food). This is especially true in Lent when we fast and remember that it was our sins that put Christ on the cross. So feasting and fasting are both high and low. The second thing I want to emphasise is their mutual importance and inextricability. We can have no true fasting if we do not also feast. Alternatively, we can have no true feasting if we do not fast. I think often one or the other of these gets more attention. Whether it is Lent coming into vogue and everyone talking about their fasts; or else we’re all ready for the next potluck or some other celebration. We need to be thinking in a rhythm of feasting and fasting (as well as a rhythm of just eating and minor fasts). To truly fast we must also have time’s of feasting. Without feasting, without special celebrations, our faith will be too focused on the spiritual lows and cultural highs. This can lead us to think too much on our sinfulness and to alienate our less-privileged brothers and sisters who cannot afford to always be fasting or who may turn to thoughts too dark by the emphasis on sin that so often accompanies fasting. Alternatively, we cannot be all feast and no fast, all cultural low and spiritual high. 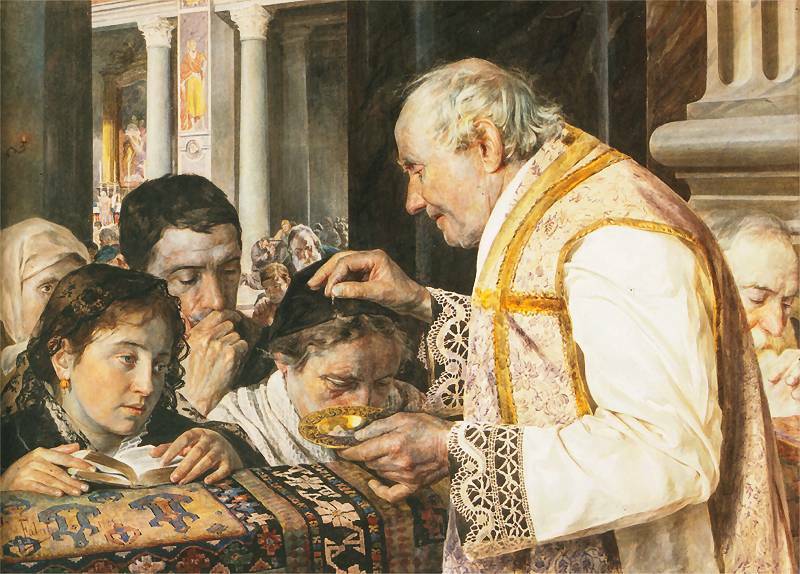 Even here, the culturally low will quickly become high as so many of our brothers and sisters will not be able to maintain so much feasting. Also, this can lead to too much focus on all the good and joyful things. A life of feasting only is what leads us to the prosperity gospel. No, we need both. We Christians must be a people who feast and fast for we are a people of both joy and sorrow.